Thanks to a sale on the Big Finish Website, I've acquired all of Series 3 of the Companion Chronicles. 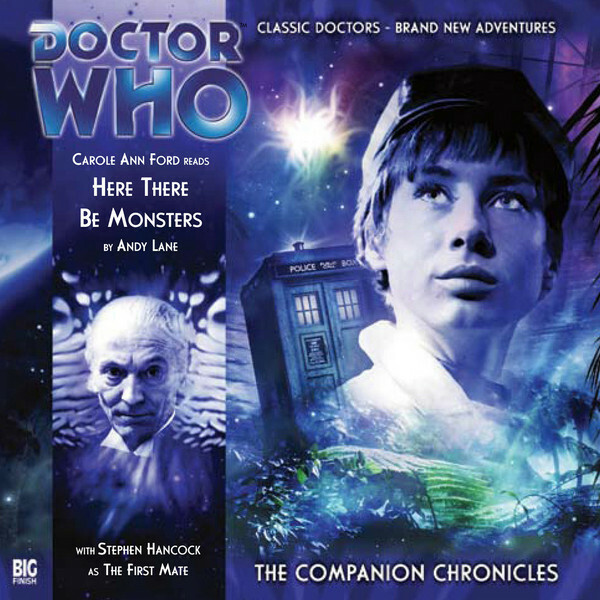 This is a classic Doctor Who audio series that focuses on a story told by one of the Doctor's companions. As such, it has a more audiobook style presentation usually with only one or two other actors. The first episode of series 3 is told by the Doctor's granddaughter, Susan. She traveled with the First Doctor and a pair of school teachers named Ian and Barbara during the first two seasons of the classic TV series. Susan has been hearing a strange man's voice that reminds her of a past adventure aboard the Tardis. The voice taunts her. She decides to purge it by relating the adventure. She, Ian, Barbara and the First Doctor land in a ship overgrown with trees and vines. They enter a minor control room and see a vine flick a switch resulting in a bang. They decide to trace the vines back to their source. It is so refreshing to hear a classic sci-fi story that actually teaches about an odd quirk in history. The relation of star exploration to sea exploration is brilliant. This is a great story that fits the large cast that the classic series sometimes stumbled around into a nice tight plot that lets each character shine. Susan Foreman is not the simpering brat she was during her run on the television series. Here Susan examines her future and her time with her grandfather as well as her reasons for joining and leaving the Tardis in general. This episode does great service to her character, but doesn't overstep its bounds. The First Doctor is depicted as a sly gentleman bluffing his way through trouble. This audio catches a great vibe for this classic hero. The First Doctor at this point is still prejudiced against humanity and untrusting of them. However, he is well on his way to becoming the Doctor who saves the day at the drop of a hat. Ian Chesterton is still the hotheaded hero that he is in the series, albeit with a minor role. He and the Doctor argue, but not as ferociously at the start of the series. He also gets some nice subtle romantic moments with Barbara. Barbara Wright plays the peace keeper between pretty much everybody. She has some great scenes that show her feisty side too. I particularly enjoyed Susan's comparison to her lecturing a school class. The First Mate is a mysterious old man that Susan runs into in the engine room. He is firendly and quickly wanders off, but Susan feels sick around him. This is the voice that taunts Susan at the start and has some strange connection to her. The ship's atmosphere is certainly unique with Rostrums vines and seeds around the ship. The "Monster" from beyond space is rendered well and is believable as something from beyond. The end is a bit anticlimactic, but fits the tone of the story. This story great for looking at Susan and the Doctor's relationship as well as giving Susan's depature in the series more weight. This is a ghost story wiht a happy ending. Well, relatively. Though some hyperbole creeps in at the seams, this story is a solidly told adventure that feels like it was plucked from early in Doctor Who's second season. All the characters spring to life with minor touches that will make any fan smile. However, I strongly suggest that you see at least An Unearthly Child, The Daleks and The Dalek Invasion of Earth from the classic TV series. After you do, listen away!